The Meeting Agenda is now available. We are pleased to announce the date of our Regional CPS meeting to be held in Winnipeg, MB and to call for papers to be presented during this meeting. If you intend to make a presentation, please submit your abstract(s) by November 23th, 2018 to Bev Godard (at Bev.Godard@umanitoba.ca). If you plan to attend, but won’t be making a presentation, please let Mrs. Godard know via email in order to help determine the number of people for lunch. Registration fees will be as follows: Regular: $20, Students: $10, and will include morning and afternoon coffee, donuts/muffins, and lunch. If authors so wish, their abstracts can be published in the Canadian Journal of Plant Pathology. In this case, the abstract should be reviewed by two colleagues before submission (see format). A publication fee of CAD $35 applies and should be paid at the registration desk. Cheques can be made out to MB-Canadian Phytopathological Society. A digital projector will be available. If you are a student, please indicate whether you want to participate in the student competition. If you intend to make a presentation, please submit your abstract(s) by December 6th, 2016 to Bev Godard. If you plan to attend, but won’t be making a presentation, please let Mrs. Godard know via email in order to help determining the number of people for lunch. If authors so wish, their abstracts can be published in the Canadian Journal of Plant Pathology. In this case, the abstract should be reviewed by two colleagues before submission (see format below). A publication fee of CAD $35 applies and should be paid at the registration desk. Cheques can be made out to MB-Canadian Phytopathological Society. For more information on the meeting and the formatting of abstracts please see the 2016 CPS-MB Invitation pdf. The 2014 Manitoba Regional Meeting of the Canadian Phytopathological Society was held on the 4th of December at the AAFC Research Centre in Morden MB. Thirty-Five people attended the event. Registration with coffee and donuts started at 9:00am. After introductions, the attendees first received a warm welcome from Dr. David Wall on behalf of Agriculture and Agri-Food Canada, and from Dr. Jim Menzies on behalf of the local arrangements committee. Dr. Deena Errampalli, the current CPS President, joined by video teleconference and made a short presentation. Dr. Errampalli welcomed the attendees and conveyed information on future CPS and joint meetings. Disease updates followed: Dr. Brent McCallum (leaf, stripe, and stem rusts), Dr. Jim Menzies (crown rust, smuts, and ergot), Dr. Khalid Rashid (flax and sunflower diseases including aster yellows, verticillium wilt, rusts, sclerotinia rots, and downy mildews), Mrs. Holly Derksen (FHB in wheat and Goss’s wilt in corn), Dr. Debbie McLaren (pulse diseases including root rots, mycosphaerella blight, mold, anthracnose, and downy mildew, as well as canola blackleg), Dr. Xiben Wang (barley diseases), Dr. Vikram Bisht (soybean and vegetable diseases). Alkher H, Adam LR, Kawchuk LM, Peters RD, Al-Mughrabi KI, Daayf F. Cross-pathogenicity of Phytophthora infestans on potato and tomato. Hajihassani A, Tenuta M. Host preference and seed-borne transmission of the stem nematodes, Ditylenchus weischeri and dipsaci. Amarasinghe CC, Tittlemier SA, Fernando WGD. Identification of nivalenol producing Fusarium cerealis in winter wheat for the first time in Manitoba, Canada. Becker MG, Girard IJ, Fernando WGD, Belmonte MF. How Low Can We Go? Optimiation of RNA sequencing libraries to study the Brassica napus – Leptosphaeria maculans pathosystem genomics. Zhu X, Islam MR, Adam LR, Daayf F. Functional analysis of potential pathogenicity determinants in Verticillium dahliae. Molina OI, Tenuta M, Daayf F. Quantification of Verticillium species using Real Time PCR in potato soils in Manitoba. Belmonte MF, Becker MG, Zhang X, Fernando WGD. Comprehensive RNA profiling of the Leptosphaeria maculans – Brassica napus cotyledon pathosystem. Bisht V, Gudmestad N, and Desjardins M. Boscalid and Azoxystrobin resistance in Alternaria solani isolates from Manitoba. Henriquez MA, McLaren DL, Conner RL, Balasubramanian PM, Chang KF, Hwang SF, Strelkov SE, Gossen BD, Penner WC. Soybean root rot and Phytophthora rot in Manitoba. After a short coffee break, awards for best student presentations were presented to two winners. 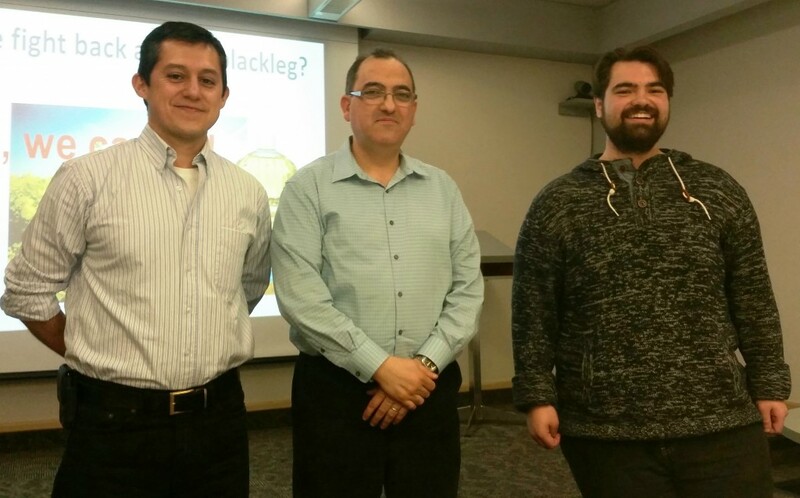 The best student oral presentation went to Michael Becker (supervisor: Dr. Mark Belmonte) and the runner-up was Oscar Molina (supervisor: Mario Tenuta). The business meeting followed shortly after. Regional Meeting. Michael Becker (right) won first place and Oscar Molina (left) took second. After welcoming the members, Dr. Daayf asked for the adoption of the minutes from last year’s meeting. The minutes were accepted by a motion from Dr. K. Rashid, seconded by Dr. B. McCallum. Dr. Daayf and Mr. Lorne Adam provided an update on the newly remodeled CPS website and invited the members to send any comments or remarks on the new website to the CPS Board. The members then discussed the possibility of hosting the annual meeting of the CPS in Winnipeg in 2017. A vote was held and the members unanimously voted for hosting the meeting in Winnipeg. Dr. Daayf and Dr. Menzies will be chairing the local arrangements committee. Dr. Daayf presented a financial update of the Manitoba regional section, and then thanked all those in the audience for coming, and Drs. Menzies, Rashid, and Bisht for this year’s local arrangements of the CPS-Manitoba section meeting. The meeting was adjourned at 4 pm.